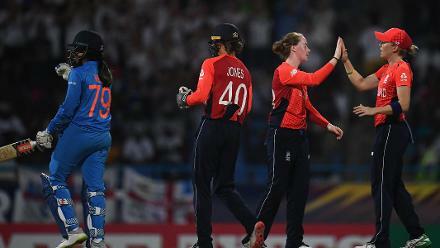 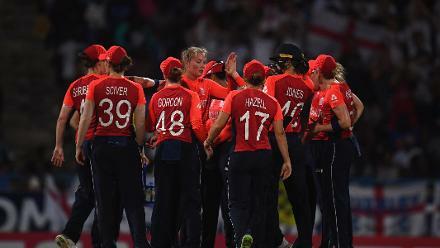 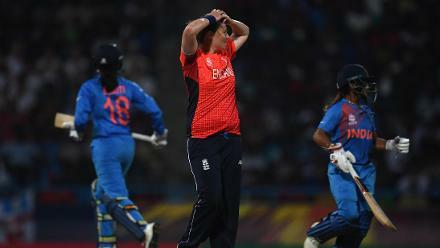 Kirstie Gordon of England(2R) celebrates after dismissing Veda Krishnamurthy of India during the ICC Women's World T20 2018 Semi-Final match between England and India at Sir Viv Richards Cricket Ground on November 22, 2018 in Antigua, Antigua and Barbuda. 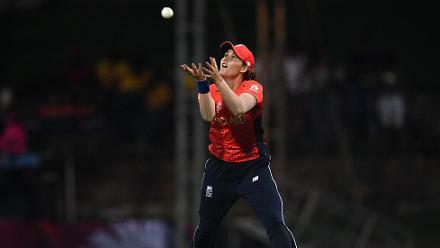 Lauren WInfield of England takes a catch to dismiss Anuja Patil of India during the ICC Women's World T20 2018 Semi-Final match between England and India at Sir Viv Richards Cricket Ground on November 22, 2018 in Antigua, Antigua and Barbuda. 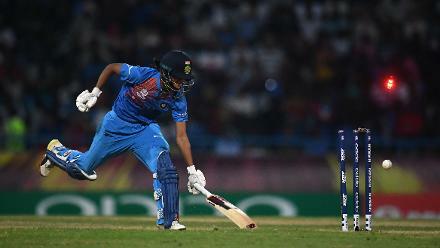 Radha Yadav of India is run out by Danielle Wyatt of England(not pictured) during the ICC Women's World T20 2018 Semi-Final match between England and India at Sir Viv Richards Cricket Ground on November 22, 2018 in Antigua, Antigua and Barbuda. 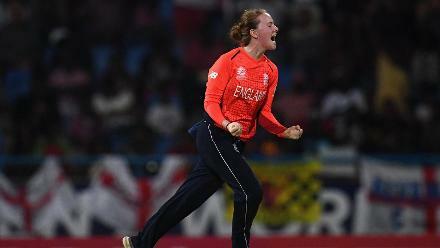 Danielle Wyatt of England(L) celebrates as she runs out Radha Yadav of India during the ICC Women's World T20 2018 Semi-Final match between England and India at Sir Viv Richards Cricket Ground on November 22, 2018 in Antigua, Antigua and Barbuda. 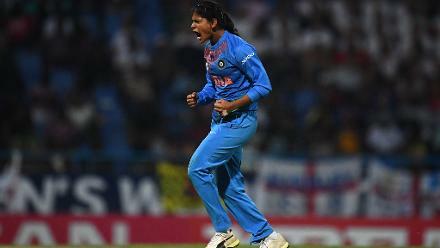 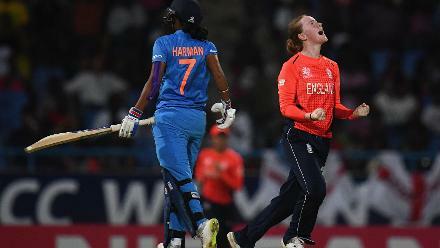 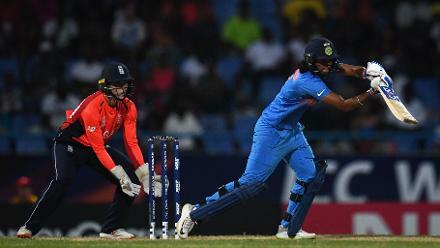 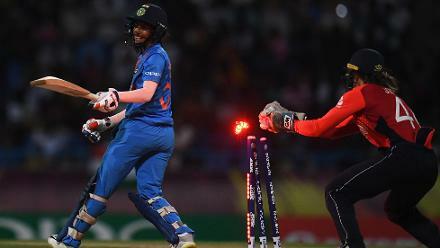 Radha Yadav of India celebrates after dismissing Tammy Beaumont of England during the ICC Women's World T20 2018 Semi-Final match between England and India at Sir Viv Richards Cricket Ground on November 22, 2018 in Antigua, Antigua and Barbuda. 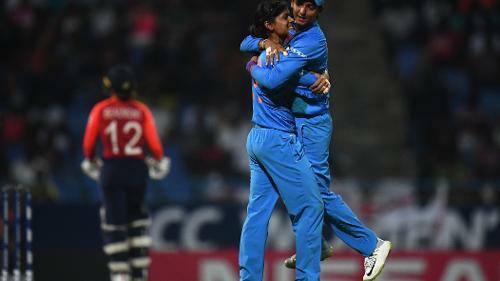 Radha Yadav and Harmanpreet Kaur of India celebrate the wicket of Tammy Beaumont of England during the ICC Women's World T20 2018 Semi-Final match between England and India at Sir Viv Richards Cricket Ground on November 22, 2018 in Antigua. 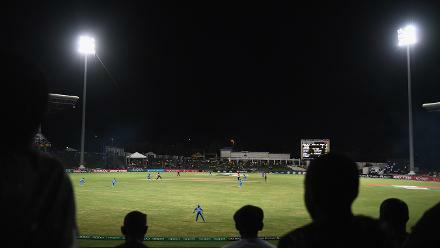 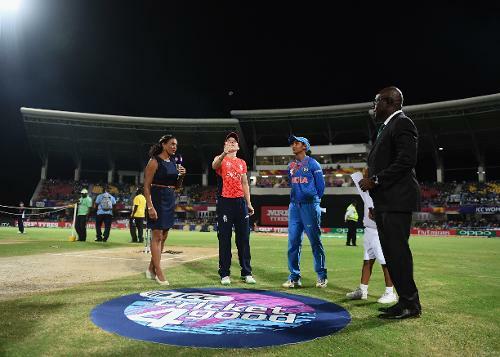 General view of play during the ICC Women's World T20 2018 Semi-Final match between England and India at Sir Viv Richards Cricket Ground on November 22, 2018 in Antigua, Antigua and Barbuda. 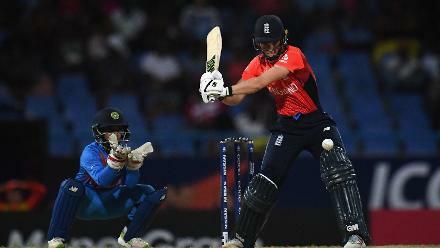 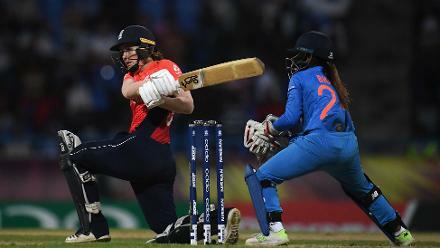 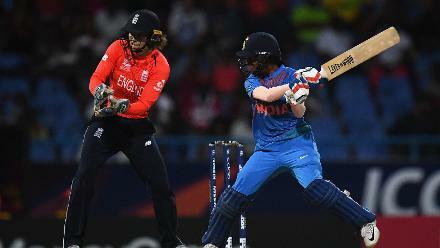 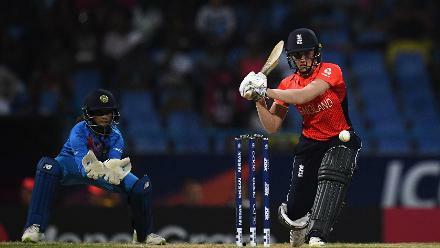 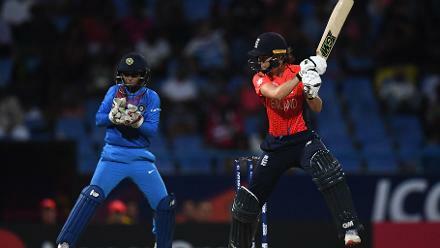 Natalie Sciver of England bats during the ICC Women's World T20 2018 Semi-Final match between England and India at Sir Viv Richards Cricket Ground on November 22, 2018 in Antigua, Antigua and Barbuda. 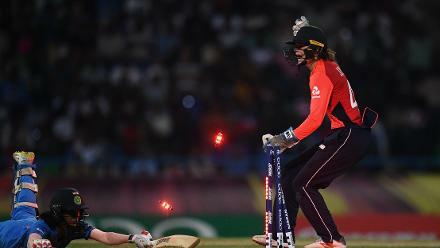 Amy Jones of England bats during the ICC Women's World T20 2018 Semi-Final match between England and India at Sir Viv Richards Cricket Ground on November 22, 2018 in Antigua, Antigua and Barbuda. 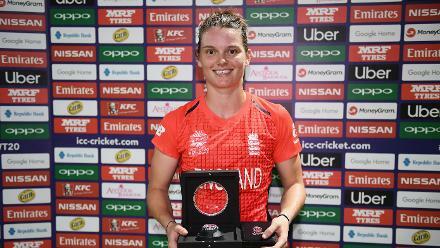 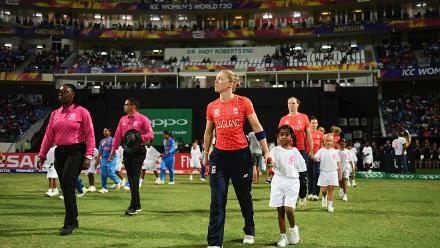 Amy Jones of England poses after being named player of the match during the ICC Women's World T20 2018 Semi-Final match between England and India at Sir Viv Richards Cricket Ground on November 22, 2018 in Antigua, Antigua and Barbuda. 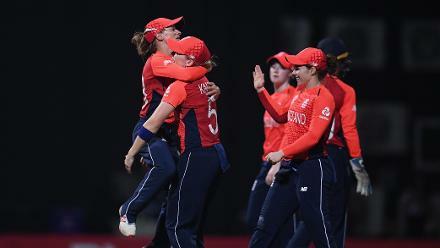 Tash Farrant and Natalie Sciver of England celebrate during the ICC Women's World T20 2018 Semi-Final match between England and India at Sir Viv Richards Cricket Ground on November 22, 2018 in Antigua, Antigua and Barbuda.